Do any of you oldtimers remember when the Bee Line Ferry crossed Tampa Bay from Bradenton to St Petersburg? In the old days before the first Sunshine Skyway bridge was built, it was a 69 mile trip from Manatee to Pinellas County. You went up 41 through Tampa and across the bay on either the Gandy Bridge on the south or the Courtney Campbell Bridge on the north through Oldsmar. The ferry shortened the trip from Manatee to Pinellas County to just 22 miles, and it crossed Tampa Bay in one hour. The ferry stopped running in the early fifties after the first Sunshine Skyway Bridge opened to automobile traffic. Too bad, because I've been told it was a fun ride. Our band rode the ferry both ways (in our school busses) twice about 1951-53 on the way to the Festival of States parade in St Pete. Always had a great time in St Pete and enjoyed the "ocean" cruise with the dolphins. Thanks, Bill Gibson, for the videos of the ferry! https://bgibson135.wordpress.com/2018/10/18/bee-line-ferry-pinellas-videos/ I never expected to find Bee Line Ferry videos, but here are links. Two videos are from the 1940s and probably both of the Ferry Pinellas. The other from the early 1950s has footage on the Pinellas Point side, no ferries visible. WOW! My dad, Raymond Keller, went home to be with Jesus and my daughter on June 29, 2017. He was 101 and had been in a total care facility since January of this year with rapidly advancing dementia. His heart finally gave out. People kept telling me I needed to record his stories and now, when it's too late, I wish I had done so. Can you identify any of these? Could you identify any of the people included in this promotional brochure? Men or women? Thanks for providing the ending for the Miss Pinellas (original). The last I had was that she foundered off of Cuba and was brought back to Key West for repairs. Nothing after that. I had thought that she might have made it to the Amazon River and been renamed. I remember the old Pinellas and miss Pinellas II well. I grew up on them, My father George Roberts was the engineer until the Skyway bridge was finished. My father and capt. Joe Winters who also owned and operated the boats were best friends.I always had free passage on the boats. When the Skyway was built and the ferry turned into a fishing "head Boat". I spent my weekends and summer vacations fishing and working on both the original Pinellass and Miss Pinellass II as a bait boy, The original Pinellas ferry boat was sold in the 60's and replace by the Miss Pinellas 2, I am the young boy on her bow in the flyers/pamphlets. The original Pinellas was sold and was lost at sea transporting refuges from Hatti. according to capt Joe Winters they had overloaded her and went down in a bad storm, her exact resting place is unknown. Does Mr. Keller Know what happened to the Miss Pinellas? The original Miss Pinellas seems to disappear from history about the time the Miss Pinellas II comes into the picture. Did the original Miss Pinellas have her name changed? Did she go to South America and run on the Amazon River? I am the daughter of Ray Keller, who is now 100 hears old. He worked on the ferries in the late 1940s and early 50s. He worked as deck hand, first mate, second mate and captain in one of those positions on all four ferries. He still has his captain's license. He tells the story of going overboard from the Sarasota when trying to get water from Tampa Bay to clean up a bathroom problem. He had a bucket weighing him down because a rope attached to the bucket was around his wrist. The wash from the boat's prop and the bucket acting as a sea anchor kept him underwater for several minutes. He finally freed his wrist and was able to get his head up and tread water. The boat kept going until a passenger reported a man overboard. The boat finally turned around and rescued my dad. He had been treading water for probably 20 minutes. And there was the time when an 11-foot gator got caught in the turning basin and the ship's prop caught it in the neck and killed it. The crew pulled it aboard and butchered it. Jimmy Levar deep-fried the tail meat on a hot plate in the engine room. The New York Yankees were on that trip returning to spring practice, and they and other passengers were able to sample gator tail, a rare treat. I have a photo of my cousin and me riding on one of the floats that was in the Festival of States parade in St. Petersburg. My mom made a big pot of chili and we rode the ferry with my dad on the last round trip of the day. Ray McNeely, can you post those photos? Do you have any of Early McMullen? I remember the Bee-Line Ferry from Bradenton to Tampa. My best recollection is 1949 when I would have been 12 years old. My dad would take me occasionally with him when he would go to Tampa to buy produce for the "Fruit Stand" that dad operated in Bradenton for a few years that my mom and aunt Dorothy worked in as well. We rode the ferry several times for this purpose but only when the freight cars did not bring fruit into Bradenton by rail. I remember the first time that my dad had me unload half a freight car filled with boxes of various fruits, it truly overwhelmed me, but dad said don't let it just remember that you can only get it done by unloading one box at a time. That was a great practical object lesson that I never forgot because it helped me tremendously during my lifelong career in engineering. Nevertheless, on one of those trips dad met Ted Williams and Warren Spahn (I believe that he was the greatest left-hand pitcher ever) and of course, they all talked a lot about baseball. Before I was born dad was with the St. Louis Browns professional baseball team and he could sure hit a ball a long way, and he could circle the base paths about as fast as Ty Cobb did it (I remember dad saying to me that Ty could run the bases in under 15 seconds which is about 14-15 MPH). As a matter of fact, base running intrigued me so much that during my engineering career I often envisioned different base running path circles in order to calculate what would be the quickest a base runner could circle the bags. Fast forward, I also remember the ferry from Fort Myers to Sanibel Island in the mid 60's, and that was when my sweetheart Cheri and I rode the ferry when we first visited the island and stayed at the Jolly Roger motel during its construction. Not even sure that the JRM is still there. Well, that's all folks. Great trip down memory lane of some truly great things in the past. Thanks for the opportunity to share. I am the youngest son born to Capt. E Ray McNeely. My dad was a ferry boat captain and superintendent of the Bee Line Ferry. I was only five when my dad passed away in 1949. I still have a lot of good memories of my father and the ferries. I have pictures of all four ferries: the Sarasota,the Pinellas, the Manatee and the Hillsborough. I was able to ride on all of them and pilot them at times. My older brother Bob Faneuf worked in the engine room of the ferries. I also remember in slow time the deck hands casting nets over the side of a ferry and catch sheepshead. A fish fry would be planned and all of the employees and their families would come and have a big seafood dinner, usually on the Pinellas point side. Riding ferries is still fun for me at 70 years old. My godfather Ernest McMullen's twin brother Early was Captain of the ferry. I long for the good old days, they were really fun, going every Sunday to Calvary Baptist Church in Bradenton from St. Pete and riding the ferry to get there. All dressed up in starch Sunday best styles of girl's clothing in shiny patent leather shoes, we could hear the noise of the machinery going up and down and making a very loud sound. It was so loud, but we loved the ferry boat and pulling off to Bradenton. After church, we would go went to Snead Island to spend the day after church with friends, the Thompson family. We loved the great atmosphere of Snead Island and I have memories of actually being able to really connect with the nicest people on the planet. I remember them to this day. God bless the Thompson family, I love them wherever they may be. Seems that there isn't much information on the web about the Bee Line Ferry, nice to see someone has brought it to us here on Florida Backroads Travel website! Thanks! I did go to St.Petersburg's Museum of History and found a good bit in the archives, they were very cooperative there! Although I never had the chance to meet my fathers--father! And, old photos were not plentiful since families got split up, but certainly would have loved to spend sometime on the waters of Tampa Bay with my Grand Dad! Thanks again for this posting! My Great Grandfather Fredrick F. Sweet was the captain on the Ferry and a pioneer of St.Petersburg. His name is on the memorial at Pioneer Park next to Al Lang Field (Progress Energy Field). My Mom and Dad managed the Piney Point site. We lived in a two bedroom apartment behind the concession stand (the rear of the building was suspended over the bay and supported by pylons). I remember sitting on my Dad's or one of the pilot's laps when I was 5 or so and they'd let me "steer" the boat. Pretty heady stuff for a kid. My parents stayed on for a close to a year after the ferries stopped running to close up the site, tie up loose ends, etc. It was an absolutely magical place to be a child and my parents must have felt the same way for they often described their years at Piney Point as being the best of their lives. I rode that ferry every Friday and Saturday night from 1946 to 1953. My dad was a gambler and went to the dog races at the race track in Sarasota, I was just a kid but loved the ride. It was during the polio scare and I remember seeing a man with blotchy arms (it was dirt from the boat railing) and I thought he had polio. I'm 80 years old and have fond memories of riding the St. Pete to Bradenton Ferry with my parents. It was a fun ride. I was also in the first procession of cars that went acrocss the new Sun Shine Skyway Bridge. I felt mixed emotions: The joy of crossing the new bridge and the sorrow of knowing the Bee Line Ferry was now a thing of the past. My family settled in the Seminole area in the 1800's, I am 73, born in PInellas County as was my mother and her mother. At age 5 we moved to Bradenton...so each weekend, my mom and sometimes my dad would load up us kids, we'd get on the ferry and go to St. Pete (Seminole) probably on a Saturday and return on Sunday. What fun memories of riding that ferry. We got to know the Captain, one was a McMullen that my mother knew and he would show us around the ferry from the "boiler room" up to the Captain's area. I remember watching the Sunshine Skyway being built...unbelievable. I wish my children and grandchildren had been able to have this kind of experience. I found this blog, searching for images of the Old Miss Pinellas which I used to go fishing in the Gulf of Mexico, on, when I was around 7 years old. I used to go with My Brother and stepfather in those days. I can still recall one trip on that old Ferry boat, in which we were caught in a storm the likes of which I've never seen either before or since , on a boat. The rain, winds, and waves were so strong that no one was certain at the time whether the boat was going to capsize. She rocked and tipped from side to side, almost capsizing several times. I may have a picture of her somewhere, but not where I am presently. Knowing that she was originally a steamer from her earlier days , I'm very surprised now that I live to tell about that stormy day. Does anyone know the fate of the Pinellas after she was used as a fishing excursion boat? I have researched her from her berth(birth 1882) in Wilmington, DE through her years as the "City of Wilmington" in Wilmington, NC and then to the Tampa Bay area as a ferry and then fishing boat. Would like to know if her remains are rotting in some known location, or if she went abroad to travel in some exotic part of the world. *If you have a picture of you, on her, and would like to share, please let me know. Thanks. Born in Saint Petersburg - Back In The Day! Loved the Ferry. After the Bee Line shut down, it became a fishing boat called the Miss Pinellas and was used for taking tourist to Fort Desoto which at the time could only be accessed by boat. When I was in the 6th grade we got to go to the ringling museum..That wasn't the best part. The best part was riding (still in the bus) on a ferry from St Petersburg to Manatee county.. When I try to tell others about it their eyes just gloss over.They surely don't believe me. I still remember my teacher name Mrs. Harold. The Bradenton Herald article on the Beeline Ferry. 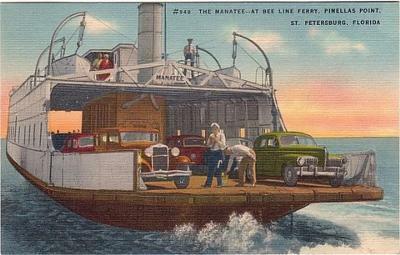 The Bee line Ferry Ran From Apollo Beach to Pinellas point in St Petersburg. O'Neils bait shop was at Pinellas Point. When the Sunshine Skyway was built, O'Neil's Bait shop moved to the end of 34th st in St Petrsburg FL where it operates today as O'Neils Marina. My Family grew up there and my uncle told me stories of the Bee Line Ferry. The Pinellas, formerly the Wilmington, had run many years on the Cape Fear river in North Carolina shuttling cargo, mail and people between Wilmington and Southport and the beaches. In 1926, the Wilmington was sold, and remodeled to become the Pinellas, a diesel ferry. For a brief time, during WWII, the Pinellas was sold to the Navy, and became the Seabrook (YFB-38). It was sold back to its original owners after the war. It was probably about this time that David may have ridden it. And then it became the fishing tour boat under "Tampa Bay Excursions, Inc." (see postcard image at the above link). That's really neat you carry such strong memories of you and your father and the Bee Line Ferry. I remember it well. On a summer vacation from PA to explore Florida for potential places to move to, my parents and I had visited cousins in Miami first. From there our '51 Chevy carried us up the Tamiami Trail to the Piney Point terminal in Manatee County, and rode the ferry to St. Pete. What a ride and what a view of the newly constructed but not yet open Skyway Bridge. We moved to St. Pete the next year. Not long after the ferry business shut down, one of the ferries was used as a fishing party boat and I made several outings on it with my father. These remain special memories of my growing up in St. Pete. Didn't know that ferry existed. It would be neat today, as another ferry runs from Fort Myers to Key West. It would be great, if a ferry ran from St. Pete (even better if it ran from Clearwater), to Fort Myers, and connected with the Key West ferry.